Be sure to click play on the video at the top of this post, because you want want to it! Noah’s finally able to keep his belly off the ground! That’s right, Noah’s creeping for the first time! Why do I say creeping and not crawling…keep reading to find out. There is some serious celebrating going on at our house once again. Isn’t it amazing how many things you can find to celebrate? 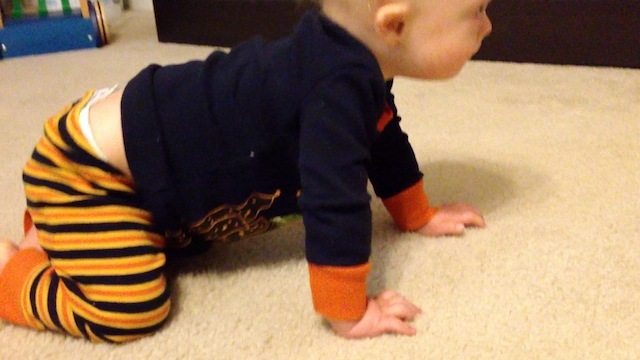 Noah has mastered the inchworm, which is actually a form a crawling. Keeping your abdomen off the ground is known as creeping in the world of development. We talked about the types of crawling in our previous article and those versions are just as important as creeping. I initially thought that Noah’s version of the inchworm was more work than creeping, however I was quickly taught by our physical therapist that the art of creeping requires a heck of a core and a lot of coordination. I don’t know if you have noticed the theme that flows through all of these milestones, but having a strong core is the foundation of most of them. So why does your occupational therapist want your child to crawl and creep? Well…these methods of transportation put weight on the hands, arms and shoulders to help develop strength and proprioception into these areas. This pressure helps with grasp, coordination, stability and eventually even things like hand-writing. I think that an occupational therapist may enjoy an open hand with extended wrist pushing on the ground the most. This can help with controlling the hand, develops the small muscles, as well as builds the arch of the hand which are all important for later fine motor skills we will want for our kids that we may not even be thinking about yet. So we will continue to encourage Noah to creep around our house while we wait for him to walk as we know that he is just mastering his penmanship. Creeping continues to have its gross motor benefits as well, as it is part of the journey to walking. In Patricia Waters book, Gross Motor Skills in Children With Down Syndrome , she states that creeping helps a child with bending their legs while walking. Without this step a child may tend to keep their legs straight and have problems with balance. It also continues to work on the core and coordinating alternating movements which are essential for walking. In several countries children tend to walk at an earlier age than American babies. This is because standing and walking are encouraged behavior rather than expecting their children to creep like most Americans. These children in other countries (like Africa and India) tend to skip creeping all together. That being said, I think it is also very common for children with developmental delays to skip creeping and go from a form of crawling straight to walking and this is ok. Enjoy your child’s journey as it is specific to them and may be faster, slower, or just different than their peers including those with Down syndrome. If they skip a step or do them out of order it will likely turn out ok, so keep celebrating all those milestones your little one continues to achieve. He’s proud, and so are we! It’s time to celebrate! Did you realize that gross motor and fine motor skills were intertwined? Did you child creep or do they go straight to walking? Leave a comment below and tell us about it. wooooooooooooohooooooooooooo noah way to crawl now daddy n mommy need to get them some skates cuss it wont be long n you will be walkin all over that house . He can get into anything! You have to keep a constant eye on this kid. Hello! I am a graduate student studying Early Childhood Special Education in order to be a developmental therapist for ages birth to 3. I love reading your blog, and I learn so such from it! When I first did practicum with a developmental therapist during my undergrad, she explained to me how important creeping and crawling are before walking, so I really enjoyed reading all the you had to say about these developmental milestones, as well as watching the video of Noah! He is so cute! Thanks for all the information you guys provide in your blog and for helping to show the world how great children with Down Syndrome are! I am glad you enjoy it 🙂 Good luck with your studies. Will you be done soon? Thank you! I just started the master’s program this fall, so I still have another two years to go. I’m looking forward to next semester when I will start my practicum and actually get to work in the field with children and their families! Thanks for the reminder to BE PATIENT! Tessa is 13 months old and she has no interest in crawling. We have been working on core strength but haven’t had much luck with our PT. We are working on switching her PT right now. I have been getting frustrated thinking she has just been in the same spot for months now, but you’re right–all of her little scoots, and bear positions, and backwards movements (even if she isn’t crawling) are helping her learn and develop…instead of rushing, I should be celebrating. Patience is so hard!! She sounds like she is doing great. And I am sure her moves are adorable. Yes, yes, YES!!! Another reason for creeping that I tell my families – strengthening those wrist, elbow and shoulder muscles prepares these little guys for the protective responses they will need when up and walking. Falling happens to everyone, and when it does, we need not only the protective response of our arms forward to catch ourselves, but the strength to withstand the forward inertia of the body and maintain those arms out straight to keep those elbows from collapsing and protect our face! Usually, when I explain this to my families, a lightbulb goes off and it’s like, “oh yeah, that is kinda important.” Though I usually do a pretty good visual demonstration of when the strength isn’t there. Another good reason 🙂 thanks!! The stairs are a serious work out!! That is awesome. 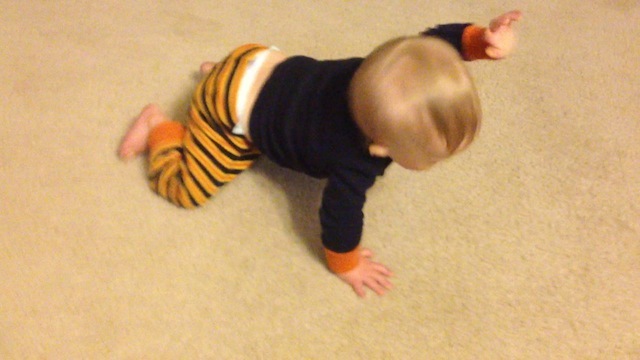 My son who is now 2 years old, skipped the crawling phase before he could walk. He creeped and learnt to stand and climbed the furniture and the next thing we knew, he stood by himself. Now he is walking but his balance is still fair, according to his OT. Will that be alright? I did ask the OT on how to solve the problem but they said i should not worry about it. What can i do to help him with his balancing problem? do you have any idea? Aumi, it is not too late to creep! Ask a therapist for help. Even if things are done out of order they are still beneficial. Good luck!